It was a wild sequence that was only made wilder by the in-arena entertainment team jumping the gun. Nate Schmidt slid a backhand towards the goal and Oscar Lindberg collected the rebound to score, but while that was going on two Blackhawks and Tomas Nosek were all sent crashing into Corey Crawford creating a mess in front of the goal. The puck was in the net, as were multiple players, the net was dislodged, and Crawford was asking for goalie interference. There was quite a bit to sort out, and unfortunately, it’s not always clear what’s exactly going on. So, here’s a look at exactly what happened and why each call was made the way it was per the NHL Rulebook. What were the calls on the ice? The play was initially ruled no goal because the net was dislodged before the puck crossed the goal line. The officials then reviewed the play and determined the puck did cross the line prior to the goal coming off, but there was goaltender interference. This determination is made by the officials in the arena. Vegas then challenged the call, thus sending the review to the NHL Situation Room in Toronto. Toronto confirmed that there was goalie interference and the play shall be ruled no goal. Why was the play reviewed originally? NHL rules allow officials in the arena to review goals under nine difference circumstances (posted at the end of this article). The puck crossing the line prior to the goal being dislodged is one of the nine. Once the review is initiated, the officials are now also allowed to determine goaltender interference. So if the play has already been reviewed, why did Vegas get to challenge and subsequently lose their timeout? The initial review is triggered by one of the nine circumstances that allow for review. 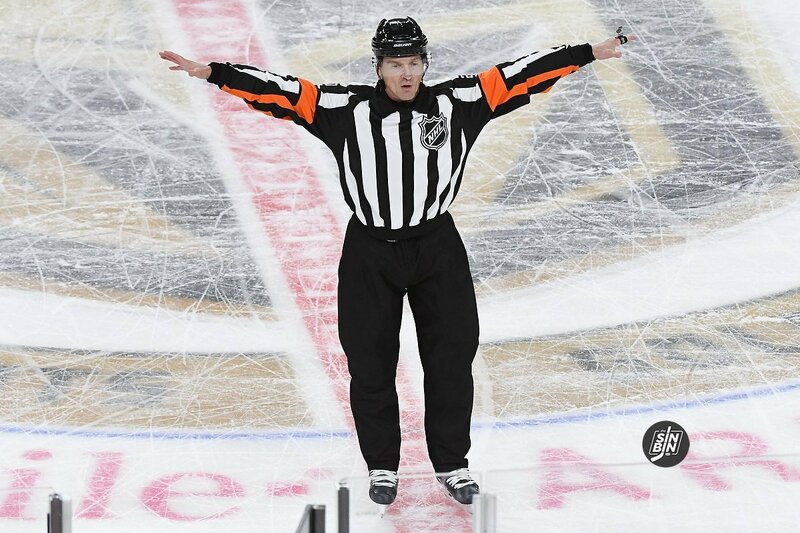 The decision to review the play is made by the “Video Goal Judge.” Coaches are only allowed to challenge under two circumstances (goalie interference and offside). The Video Goal Judge and in-arena officials make the determination on video reviews triggered by one of the nine circumstances, the NHL Situation Room in Toronto has the final decision when a coaches challenge is made. So, Vegas challenged the official’s decision and wanted the Situation Room to make a ruling on the play. The Situation Room agreed with the ruling and thus Vegas loses their timeout. Does there have to be conclusive evidence to overturn the in-arena officials decision? Why does that matter in this case? It’s the only reason why there are two reviews. Part of the process for the coaches challenge is that there is an “original call on the ice.” Without an original call, the Situation Room does not have a standard as to which they must overturn. The call on the ice is the standard and only conclusive evidence can overturn that call. So, the in-arena officials have to make their ruling before they send it to Toronto. They made their ruling in the first review, the Situation Room made theirs in the second one. The standard practice is that if the call is “confirmed” it means there is video evidence to support the ruling on the ice, if the call “stands” it means there was not video sufficient evidence to overturn the call and thus the call on the ice was used. In the case of this call, the NHL “confirmed” the goalie interference. How does the NHL define goaltender interference? The entire rule, which is long and quite drawn out, is posted at the bottom of this article, however, there’s one portion that explains it fairly succinctly. Things get more interesting when you consider the play we have at hand here. The ruling on the ice is that Nosek pushes the Chicago player into the goalie. Per the rules, this does constitute goalie interference. Obviously there is a lot of grey area here and the league has struggled to find a level of consistency with these calls, but the most important point to note is that if they believe the attacking player hindered the goalie from “doing his job” the play will be called goalie interference and no goal will be awarded. That’s what the league determined on this one. But wasn’t Nosek pushed/tripped by the other guy causing a chain reaction? If you ask me, yes he was. If you ask the NHL, no he was not. If indeed it was determined that Rutta tripped Nosek which caused Nosek to push Martinsen, then this would be considered contact forced by the defending player, which would have resulted in a good goal. The NHL determined that did not happen and that Nosek’s contact with Martinsen is what caused the interference, thus attacking player causing defending player to contact goalie. Then shouldn’t it have been a penalty on Nosek? By rule, not necessarily. It is only deemed a penalty if the contact is deliberate. In other words, was Nosek pushing Martinsen into Crawford deliberately to help Vegas score. The on-ice ruling, prior to either video review, was that Nosek was not tripped by Rutta and he did not deliberately push Martinsen into Crawford. They are essentially claiming that Nosek lost his edge and fell down on his own. He fell into Martinsen, who contacted Crawford. All of this is moot when it comes to video review however as the rules dictate that a video review cannot lead to the assesement of a penalty. Let’s go back to the goal dislodging. What if the goal was off before the puck crossed the goal line, does that automatically mean it’s not a goal? Actually, no. The net can be dislodged and a goal still be allowed. All conditions were met in this case. Granted the puck did cross the goal line before the net came off, but even if it did, the goal still should have been awarded under this rule. Who are the guys making the calls in the NHL Situation Room? I could not find an updated list for 2018-19 on the ex-officials, but the guys who did it last year (and are likely still doing it this year) are Don Koharski, Paul Devorski, Rob Shick, Mick McGeough, Don Van Massenhoven, and Bill McCreary. player, either by his positioning or by contact, impairs the goalkeeper’s ability to move freely within his crease or defend his goal; or (2) an attacking player initiates intentional or deliberate contact with a goalkeeper, inside or outside of his goal crease. Incidental contact with a goalkeeper will be permitted, and resulting goals allowed, when such contact is initiated outside of the goal crease, provided the attacking player has made a reasonable effort to avoid such contact. The rule will be enforced exclusively in accordance with the on-ice judgement of the Referee(s), but may be subject to a Coach’s Challenge (see Rule 78.7). For purposes of this rule, “contact,” whether incidental or otherwise, shall mean any contact that is made between or among a goalkeeper and attacking player(s), whether by means of a stick or any part of the body. enters the goal crease and, by his actions, impairs the goalkeeper’s ability to defend his goal, and a goal is scored, the goal will be disallowed. attacking player for purposes of this rule, provided the attacking player has made a reasonable effort to avoid such contact. If a defending player has been pushed, shoved, or fouled by an attacking player so as to cause the defending player to come into contact with his own goalkeeper, such contact shall be deemed contact initiated by the attacking player for purposes of this rule, and if necessary a penalty assessed to the attacking player and if a goal is scored it would be disallowed. 69.3 Contact Inside the Goal Crease – If an attacking player initiates contact with a goalkeeper, incidental or otherwise, while the goalkeeper is in his goal crease, and a goal is scored, the goal will be disallowed. If a goalkeeper, in the act of establishing his position within his goal crease, initiates contact with an attacking player who is in the goal crease, and this results in an impairment of the goalkeeper’s ability to defend his goal, and a goal is scored, the goal will be disallowed. If, after any contact by a goalkeeper who is attempting to establish position in his goal crease, the attacking player does not immediately vacate his current position in the goal crease (i.e. give ground to the goalkeeper), and a goal is scored, the goal will be disallowed. In all such cases, whether or not a goal is scored, the attacking player will receive a minor penalty for goalkeeper interference. If an attacking player establishes a significant position within the goal crease, so as to obstruct the goalkeeper’s vision and impair his ability to defend his goal, and a goal is scored, the goal will be disallowed. For this purpose, a player “establishes a significant position within the crease” when, in the Referee’s judgment, his body, or a substantial portion thereof, is within the goal crease for more than an instantaneous period of time. Refer also to Reference Tables – Table 16 – Interference on the Goalkeeper Situations (page 151). 69.4 Contact Outside the Goal Crease – If an attacking player initiates any contact with a goalkeeper, other than incidental contact, while the goalkeeper is outside his goal crease, and a goal is scored, the goal will be disallowed. A goalkeeper is not “fair game” just because he is outside the goal crease. The appropriate penalty should be assessed in every case where an attacking player makes unnecessary contact with the goalkeeper. However, incidental contact will be permitted when the goalkeeper is in the act of playing the puck outside his goal crease provided the attacking player has made a reasonable effort to avoid such unnecessary contact. When a goalkeeper has played the puck outside of his crease and is then prevented from returning to his crease area due to the deliberate actions of an attacking player, such player may be penalized for goalkeeper interference. Similarly, the goalkeeper may be penalized, if by his actions outside of his crease he deliberately interferes with an attacking player who is attempting to play the puck or an opponent. Refer also to Reference Tables – Table 16 – Interference on the Goalkeeper Situations (page 151). (i) Puck crossing the goal line. (ii) Puck in the net prior to the goal frame being dislodged. (iii) Puck in the net prior to, or after expiration of time at the end of the period. (iv) With the use of a foot/skate, was a distinct kicking motion evident? If so, the apparent goal must be disallowed. A DISTINCT KICKING MOTION is one which the player propels the puck with his skate into the net. If the Video Goal Judge / NHL Situation Room determines that it was put into the net by an attacking player using a distinct kicking motion, it must be ruled NO GOAL. This would also be true even if the puck, after being kicked, deflects off any other player of either team and then into the net. This is still NO GOAL. However, a puck that enters the goal after deflecting off an attacking player’s skate or that deflects off his skate while he is in the process of stopping, shall be ruled a good goal. See also 49.2. A goal cannot be scored by an attacking player who kicks any equipment (stick, glove, helmet, etc.) at the puck, including kicking the blade of his own stick, causing the puck to cross the goal line. (v) When the puck has been directed, batted or thrown into the net by an attacking player other than with the stick. When this occurs, if it is deemed to be done deliberately, then the decision shall be NO GOAL. A goal cannot be scored when the puck has been deliberately batted with any part of the attacking player’s body into the net. (vi) Puck deflected directly into the net off an Official. (vii) Puck struck with a high-stick, above the height of the crossbar, by an attacking player prior to entering the goal. The determining factor is where the puck makes contact with the stick in relation to the crossbar. If the puck makes contact with the portion of the stick that is at or below the level of the crossbar and enters the goal, this goal shall be allowed. (viii) To establish the correct time on the official game clock, provided the game time is visible on the Video Goal Judge’s monitors. These replay situations (goals allowed, disallowed, off sides, late penalties,etc. ) are a joke- they drastically impact the game and it’s momentum for one side or the other. Make the calls instantaneous or as close to near as possible to avoid holding up the game. Could not disagree more. With all the replays available we should not let games be decided by incorrect calls. Let the players make the human errors not the refs.